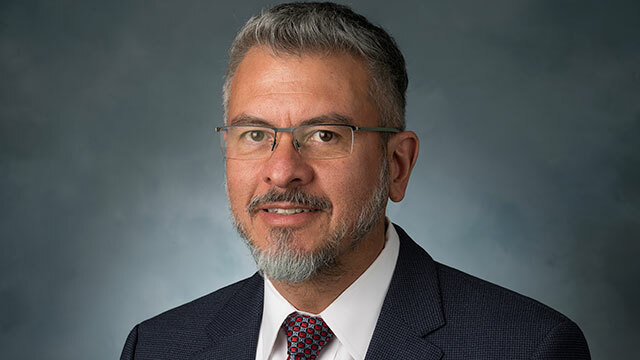 Martin F. Sancho-Madriz has been named associate vice president for Faculty Affairs. Professor Martin F. Sancho-Madriz has been named associate vice president for Faculty Affairs, effective June 1. As the AVP, Sancho-Madriz will have primary oversight and responsibility for planning, coordinating and implementing academic personnel matters related to faculty and administrators in Academic Affairs. He will coordinate recruitment, appointment, and mentoring of faculty, including retention, tenure, and promotion (RTP) processes for tenure-track faculty; oversee the range elevation process for temporary faculty; interpret and ensure compliance with the faculty (Unit 3) and Academic Student Employee (Unit 11) collective bargaining agreements; facilitate informal resolution of faculty complaints; process formal faculty contract grievances; and oversee retirement and faculty in early retirement program (FERP). Sancho-Madriz earned a BS/Licentiate degree in food technology from the University of Costa Rica, followed by master’s and doctoral degrees from Cornell University in food science and technology with a concentration in food process engineering. In 1997, he joined Cal Poly Pomona to develop a new undergraduate degree program in food science and technology. He served as director of the FST Program for 18 years and as chair of the Department of Human Nutrition & Food Science for seven years. He currently serves as the associate dean of the College of Environmental Design. Professor Sancho-Madriz has served on multiple committees at the department, college and university levels. Currently, he serves on the University Strategic Planning Steering Committee and WSCUC Accreditation Steering Committee. He represented the College of Agriculture in the Academic Senate for 13 years, serving as Chair of the Faculty Affairs Committee and Chair of the Academic Senate. The provost thanks Sep Eskandari for his service and support during this transition. She also thanks the search committee, co-chaired by Halima El Naga and Victoria Bhavsar, for conducting a smooth and successful search.